Discover the beauty of the South Coast with a 1/2 hour motorboat tour up Jamaica's largest navigable river and through Jamaica's largest wetland area, the Black River lower morass. Our basic tour takes you six miles up the river, during which a running commentary is given by your captain/ tour guide on both the ecology and history of the area. Over 100 species of birds have been recorded in the Black River morass and many will be seen during your trip. 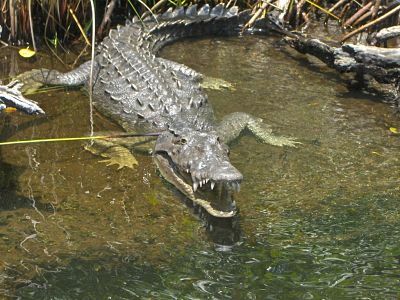 The endangered American Crocodile (Crocodylus acutus) inhabits the area and sightings are very frequent! The wetland vegetation is of special interest with three species of mangrove, thatch palms, royal palms with freshwater swamp forest dominating - A not-to-be-forgotten experience!